Beautiful 'Classic' or 'Fun' Portraits for your Guests at Weddings, Events, Military & Corporate Functions, Graduations, Proms, Parties! We bring the Classic Open Air PhotoBooth Studio to your Event with Two Pro Studio Strobe Lights with umbrellas and on Camera Flash! A Choice of Vintage Style 'Classic' Quality Portraits or 'Fun' Portraits (with our wide variety of Props), are taken by an Experienced & Engaging Pro Photographer with Pro Cameras, not s selfie booth, no pressing of a tablet button! 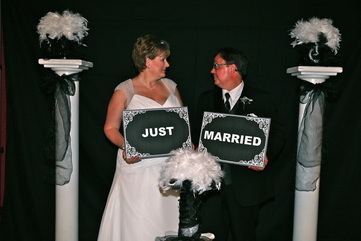 We will CUSTOM Stylize to any event using our own Backdrops and wide variety of Fun Props, or use your own! Whether your Event Theme is Rustic, Traditional, Corporate or Fun, we provide Quality Classic or Fun Portraits taken by an engaging Pro Photographer with our Pro PhotoBooth Studio Lighting and printing on site! 3 Choices of Backdrops in Black, White or Hand Painted Garden Canvas! Vintage Portraits are Timeless and a Work of Art! Fun Portraits are great too! A Great Idea to give out as Thank You Gifts to your Guests! We Provide Custom Design Services, for Thank You Cards, to send out to guests after your event. Plus Quality Albums & Canvas or Metal Wall Art at Holst Photography Studio. Package 1: Quality High Res Edited Images in online Gallery, guests View Photos & Share them on social media with Free High Res Gallery Download with printing rights (no printing on site). Order Prints & Wall Art from the Gallery Store with Direct Door Delivery! Package 2: Quality unedited 4x6 photos with 1 Image, printed on site & Edited High Res Images in online Gallery, guests View Photos & Share them on social media with Free High Res Gallery Download with printing rights. Option to Order more Prints & Wall Art from the Gallery Store with Direct Door Delivery!